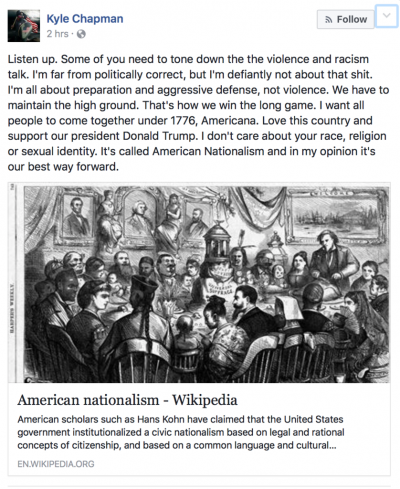 Kyle Chapman, also known as Based Stickman, Captain Texas or the Alt-Knight, is civic nationalist, and a former Ron Paul & Rand Paul supporter, who defected towards Trump after seeing him speak during the debates. Wearing a 3M respirator and a helmet, and holding a shield, he hits antifascist protestors with a wooden stick during the March for Trump at Berkeley, and doesn't afraid of anything. Chapman is an advocate for the physical removal of communists. Many of his former supporters especially on /pol/ didn't like him anymore after he said he was a civic nationalist. He is still worshiped as a god on /r/the_donald. Future lulz is expected to be had with his hapa progeny. The Alt-Knight physically removes Communists. This page was last edited on 9 January 2018, at 06:20.